Putin has never smiled so sincerely on the world stage. And in spite of increasingly disturbing details continuing to emerge regarding the torture and murder of Jamal Khashoggi, the Saudi Crown Prince was similarly celebratory. In a nonverbal amalgam of a High-Five and a Bro handshake, Vladimir Putin and Mohammed bin Salman conducted more than a bit of theater in Buenos Aires on Friday, 30 November 2018. Their actions could easily be substituted for two athletes - jubilant after scoring a goal. Both Putin and the Prince have had journalists and their political enemies killed - and yet both men have gone unpunished. Moreover, Russia has recently renewed its military aggression against Ukraine - while the Saudi-led War in Yemen continues to kill tens of thousands of civilians via explosives, disease, and massive starvation. 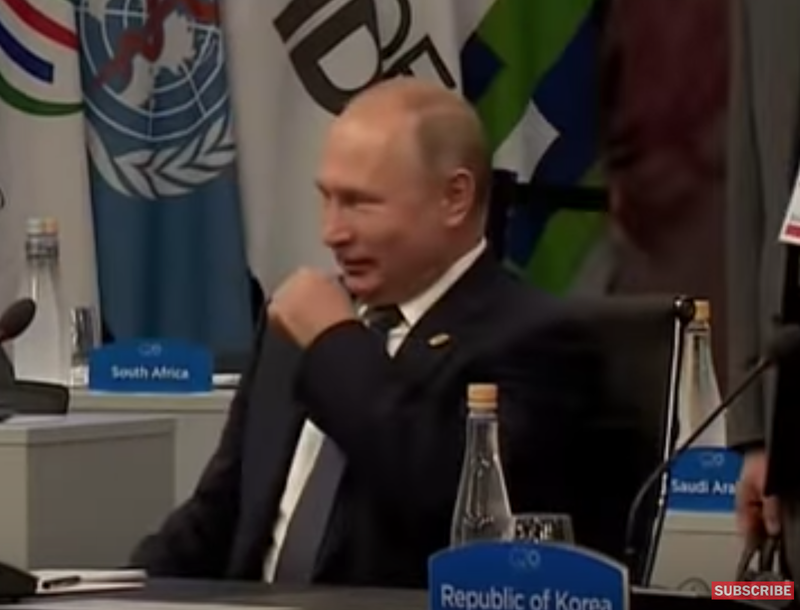 What follows is a detailed nonverbal analysis of this G20 moment. Vladimir's smile is NOT feigned - rather it's quite sincere. Moreover, there's also a component of laughter. In this moment, the Russian is experiencing true joy-happiness. The elevation of their hands is also quite significant - for the higher the hands, the greater the joy. A split second later, their hands enthusiastically meet. Donald Trump, in the background, appears to be looking briefly at the two men. 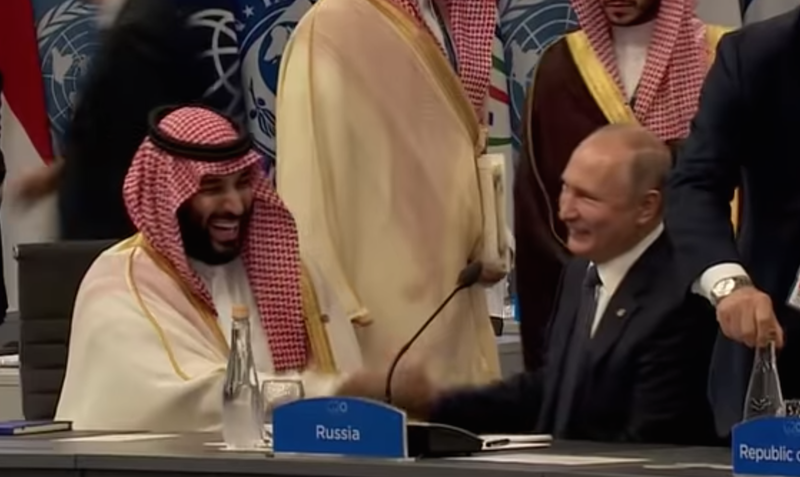 Mohammed bin Salman then pats the back of Vladimir Putin's right hand three times. While in serious contexts, such momentary double hand clasps would be a dominance display - in the midst of true joy-happiness, this action augments their jovial emotions - similar to back-slapping. It also serves as a bonding agent. Note that Putin's eyelids are still completely closed - a characteristic common to significant and sincere laughter. The majority of times, during traditional handshakes, most people make the profound mistake of making very little eye contact. 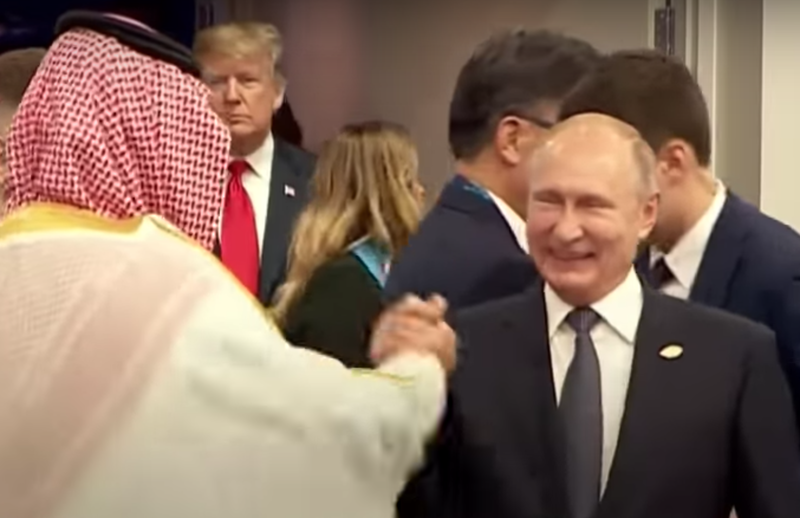 Yet, as the Crown Prince continues to pat President Putin's hand, the Russian reestablishes eye contact. 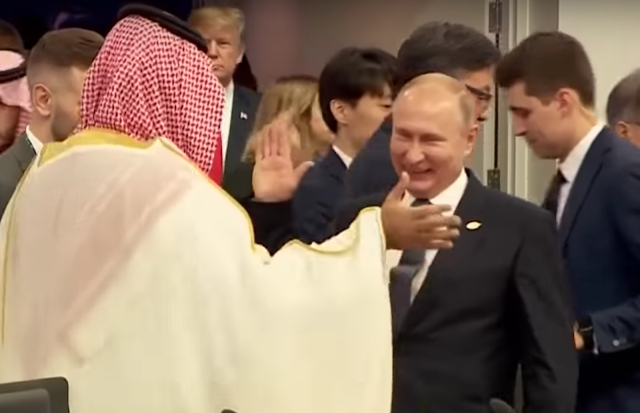 These two additional handshake components - the Prince's hand patting and Putin's repeated eye contact - are crucial and drive home the significance and true sincerity of this moment. 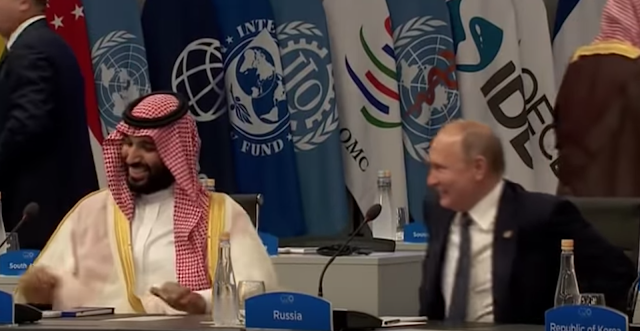 As they turn to sit down and Mohammed bin Salman turns his face in view of the camera, we can see he also has a sincere smile of true joy-happiness (aka a Duchenne Smile). His closed/almost closed eyelids also signal a component of true laughter. 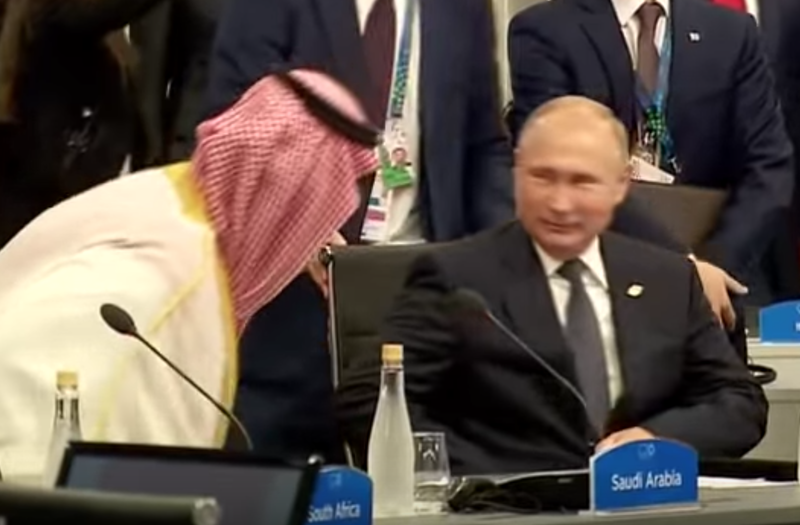 As he sits down Putin gives the Prince another round of eye contact. After they sit down, they once again shake hands in the bro-handshake - common to younger men in informal settings. 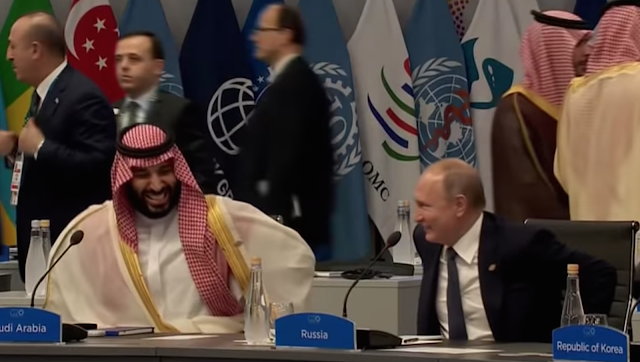 Mohammed bin Salman crescendos into more intense laughter - while Putin continues his sincere smiling. In another intriguing moment, both men simultaneously readjust in their chairs. This behavior, termed Mirroring, is a signal they are of similar mindsets, they like each other - and indeed are in sync. 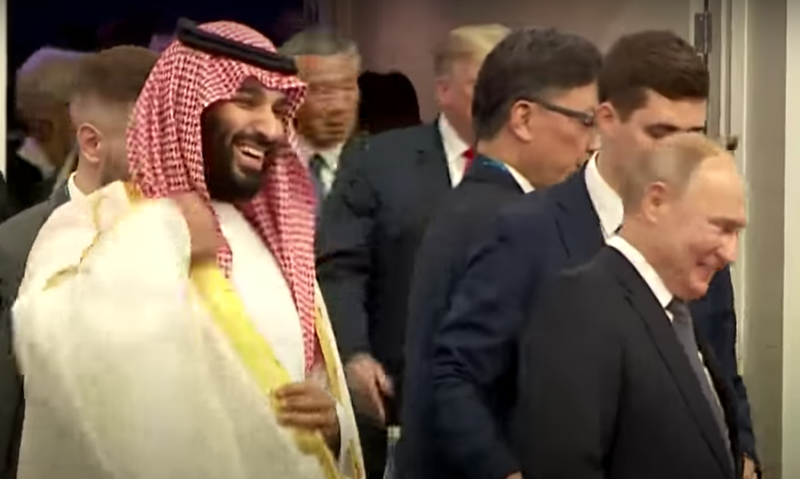 The Saudi Crown Prince then rapidly rotates his head once quickly to his right (0:22 - 0:23) - very much nonverbally celebrating/exclaiming to his partner, "Can you believe it! This is too good to be true!" - as the Russian President looks on. Putin then clears his throat (0:23) as he displays just a bit of post-performance anxiety - signifying the thought-emotion of, "Okay, that bit of acting is over". 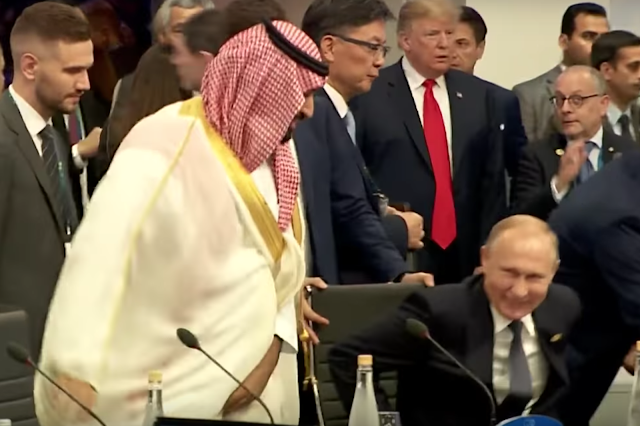 SUMMARY: There's no doubt that Vladimir Putin and Mohammed bin Salman at least partially choreographed their greeting at the G20 for all the world to witness. And in so doing, they were very deliberately giving the middle finger to the rest of the planet - particularly the United States, the U.S. Senate - and especially President Trump. 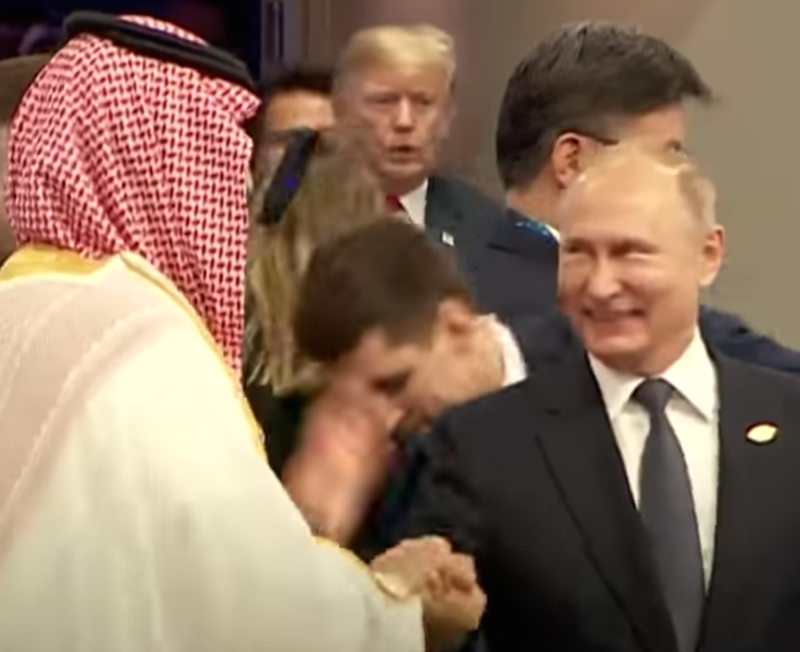 If you were directing a film and desired to signal to your audience that these two characters had indeed planned this scene - look no further than Putin and the Crown Prince for an example. But, it's crucial to note, that although their performance was planned, at the same time both men were quite sincere in their displays of true joy. Acts some people find to be heinous and reprehensible - are those in which others will take pleasure. 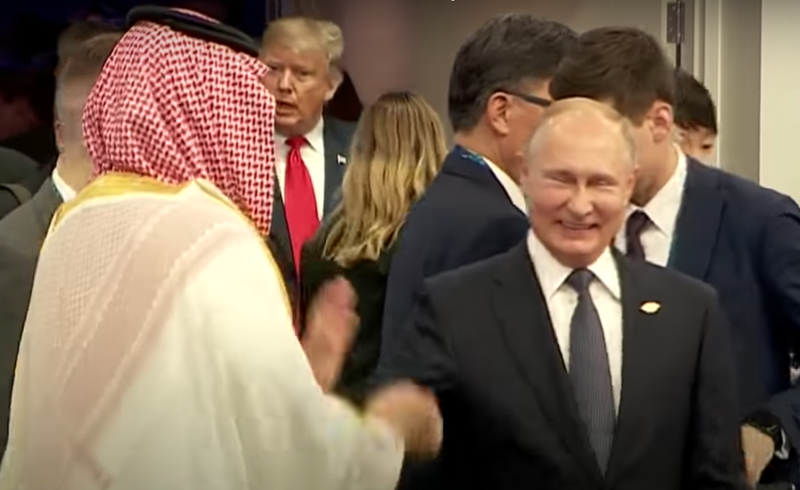 You may very well despise Vladimir Putin and Mohammed bin Salman - but here's the Rub: to note similar times when someone who you like, believe, and/or trust - exhibits identical nonverbal behavior (e.g., in everyday scenarios). If we fall victim to confirmation bias - would we then be able to spot the lie? The Insincerity? The manipulation? No - most people would be fooled. Body Language Analysis No. 4357: Donald Trump's response, "What a stupid question"